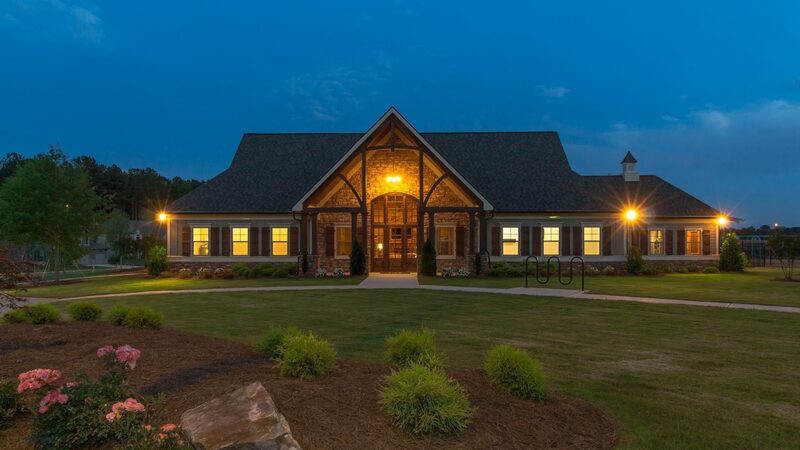 Oakleigh Pointe – Welcome Home to Paulding County! Offering homes of nearly every imagining – ranch, two-story and master on main – Oakleigh Pointe appeals to everyone from first time homebuyers to empty nesters! With a remarkable Eight floor plans from which to choose featuring price points starting in the $260s, homes in Oakleigh Pointe showcase the variety of options today’s Atlanta homebuyers desire. Offering 4-to-6-bedrooms and ranging in size from approximately 2,300-3,800 sqft, Oakleigh’s Traditional and Craftsman-inspired floor plans are designed to reflect an exquisite balance of luxury and livability. The beauty of homes in Oakleigh Pointe is matched by the appeal of resort-quality amenities, which include a stunning Clubhouse for community gatherings, Jr. Olympic-sized swimming pool with a water slide & splash pad, tennis courts, playground, and dog park for the four-legged members of your family. Poised on the outskirts of Paulding County’s City of Dallas, Oakleigh Pointe homeowners enjoy the Main Street charm of a true Southern City balanced with convenience to the world-class shops and restaurants of the Avenue of West Cobb and the chic boutiques and eclectic array of eateries of Marietta’s Town Square. Residents of Oakleigh Pointe can take regular excursions to Kennesaw Mountain National Battlefield, picnic on the shores of Lake Acworth and soak up some history at Pickett’s Mill Battlefield Historic Site. From I-20 West: Take exit 44 for GA-6/Thornton Rd toward Austell Turn right onto GA-6 W/Thornton Rd Turn right onto Poplar Springs Rd Turn left onto GA-360 W Turn right onto GA-92 N Turn left onto Due West Rd Oakleigh Pointe is Ahead on the left! From 75 North: Exit 261 Delk Road Continue onto 280/South Cobb Drive Turn right on GA-5 North Turn left onto South Marietta Pkwy Turn Left onto Whitlock Ave Turn Right onto Burnt Hickory Rd. Turn Left onto Due West Rd. Turn Left onto GA-92 Turn Right onto Due West Rd. Oakleigh Pointe is on the left!